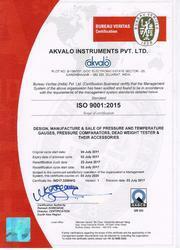 Established in the year 2001, we, Akvalo Instruments Pvt. Ltd., is an ISO 9001:2015 Certified organization engaged in Manufacturing and Exporting a wide gamut of Gauges and Testing Equipment. Our products range includes Differential Pressure Gauges, SS Gauges Accessories, Pressure Gauges and much more. All the products are manufactured using best quality raw material which is sourced from the famed vendors of the market. This range is manufactured as per the industry set quality standards and norms, we offer these products available in varied customized designs according to the specifications detailed by our patrons. Our products are widely acclaimed for their precise construction, dimensional accuracy, trouble-free performance, longer service life and accurate measurements by our valued clients from varied parts of the globe. Under the valuable guidance of Our CEO Mr. C. V. Lohi. we have succeeded in garnering a huge clientele for our selves. His entrepreneurial capabilities and excellent managerial skills have always supported us in standing ahead of our counterparts in the industry. We are blessed with a sophisticated infrastructure facility, which aids us in manufacturing the offered range of products. Our facility is segregated into varied departments such as Manufacturing, Storage, R&D and other departments for the proper and smooth functioning of all the business activities. All this facility is managed by a team of diligent professionals, who hold the immense expertise and knowledge of the industry that benefits us in delivering excellent quality products to our patrons. Furthermore, we have installed these facilities with latest tools and equipment that aid us in meeting bulk and urgent requirements of clients. We also have a very spacious and capacious warehouse for the proper storage of all the raw material and finished products. Since our establishment, we pay utmost importance to all the clients associated with us and we always strive to gain the utmost satisfied customers in our clientele. All the products offered by us are manufactured as per the quality standards set by the industry and are stringently examined before delivering them to our clients. Furthermore, we hold expertise in offering these products in varied designed models and even have the capability to meet urgent requirements of our clients. Besides, on a regular interval of time, our professionals interact with our clients to know their exact requirements and forgetting their feedbacks and suggestions. We are backed by a team of experienced and deft professionals, who aid us in offering this range of Differential Pressure Gauges, Pressure Gauges, SS Gauges Accessories and much more. All the professionals associated with us are highly motivated and perform all the assigned tasks with complete dedication. Our professionals always strive to provide these products as per the exact requirements of the clients by interacting with them at regular intervals. Thus, our professionals try to understand the demands and changing requirements of customers and also try to incorporate the given suggestion in the offered product-line. These professionals maintain a healthy work environment in the organization, which benefits us in accomplishing the consignment within the stipulated time period. Along with this, our professionals also offer finest possible services such as installation training, on-site support, operational training and a user manual to the customers. We have succeeded in creating a great niche in the market by offering a wide gamut of Differential Pressure Gauges, Pressure Gauges, SS Gauges Accessories and much more to our esteemed clients from varied parts of the region. Owing to our quality assured range of ISO Certified products, fair and ethical business policies, client-centric approaches, we have been able to mark our presence in this highly competitive market. Moreover, we offer this range in varied specifications with custom-design models to meet the variegated requirements of our valued clients in an efficient manner, in compliance with the international quality standards. 6 ESSAR Constructions (India) Ltd.
13 Nuclear Thermal Power Corporation. 15 Doshion Veolia Water Solutions Pvt. 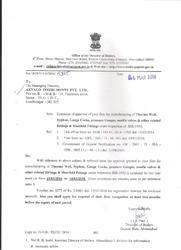 Ltd.
21 Rukmani Power and Steel Ltd.